The biggest stumbling block for me was choosing a bed. I didn't want anything too domineering, princessy, bulkily wooden (unless it was my ultimate BDDW bed, which it wouldn't be). 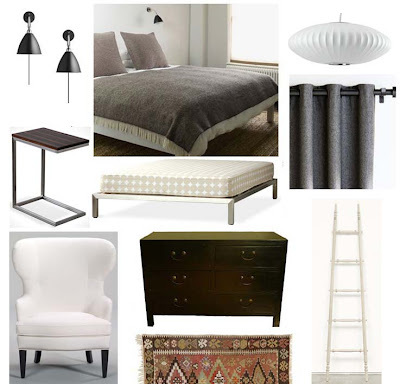 It fast became apparent that I don't really want to see much of a bed, so I've selected this very lean base from Stylegarage. I'll dress it exactly like the inspiration image. The other large investment will be the pair of Bestlite lamps. I think they're worth it and have started to save for them. I can't find anything cheaper that I like as much and that wouldn't constantly remind me how much I would prefer the Bestlites. Other things I already have: A similar kilim rug. And the chest of drawers pictured is my existing one, purchased from a local Toronto store many years ago. The drapes shown here are from West Elm. So, I'm dying to know what you think? Please, be gentle.